Our team advises investors across a wide range of commercial real estate sectors. 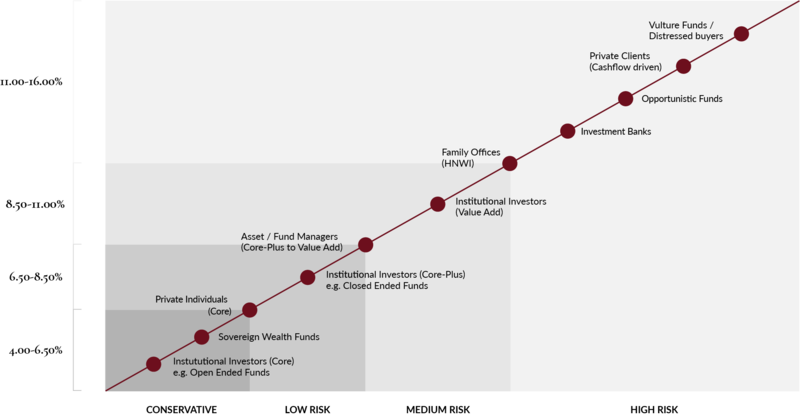 Our clients also invest across a spectrum of risk categories; either specializing in one field or diversifying exposure in different asset classes. Within the ‘Industrial’ sector clients look at logistic parks, light manufacturing facilities, single tenant buildings, small business units as well as land for owner occupier or developer deals. ‘Office’ categories tend to differ according to whether they are Warsaw or regional city based as well as ‘in-town’ or ‘out-of-town’ business park style properties. ‘Retail’ investment tend to be sectorised according to ‘in-town’ shopping centres, hypermarket anchored shopping centre galleries, retail parks (neighborhood strip malls) and high street single let units. We combine all other categories under ‘Niche’ investments, which may include categories such as hotels, leisure investments, nursing homes, student housing, residential private rental sector and self-storage. We advise numerous real estate sponsors operating across a wide risk spectrum. The most conservative, or “Core”, investors are generally seeking stabilised, low-leverage “trophy” properties located in prime locations. These investments typically feature credit quality tenants on long-term, triple net leases. We also advise “Core-Plus” investors that are willing to take a risk on one or two elements of the features expected by a Core investor in return for a better yield. We also work with investors seeking “Value Add” returns and willing to implement value enhancement initiatives. This may be achieved by leasing vacant space, renewing leases, re-gearing debt, refurbishing common parts or reconstructing the building etc. We also act for funds seeking the most “Opportunistic” returns. These are generally found in distressed properties, new developments or properties in emerging markets; where the higher risk is reflected in the potential upside. We advise institutional investors, such as pension funds, insurance companies, foundations, endowments, fund-of-funds and sovereign wealth funds that invest in all risk categories according to their cost of capital. We also work with fund managers responsible for deploying limited partners capital as well as operators overseeing capital deployment and the day to day running of the properties. These are often leveraged funds that are IRR driven. 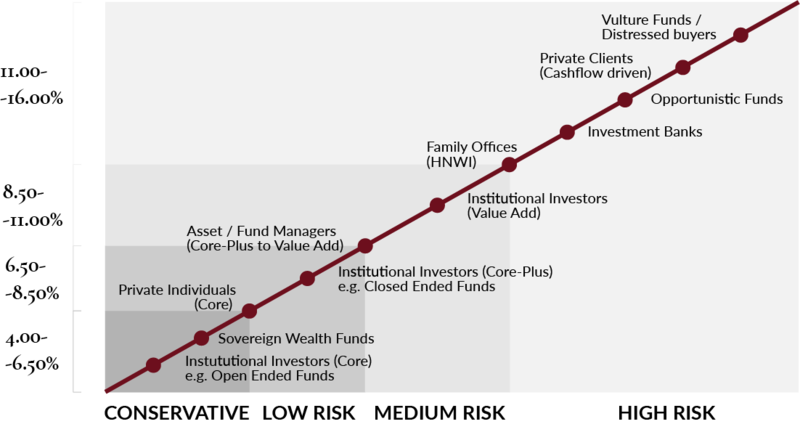 We also work with high net worth individuals that may deploy capital directly or via a family office. Typically these investors are more interested in accumulated long term wealth and a yield on equity. We also work with banks either seeking underwriting advice in respect of distressed assets or on non performing loans in need of restructuring or disposal. We also work closely with developers that may either be looking to acquire land, secure funding or dispose of a newly developed investment product.